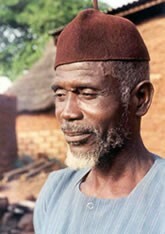 The Jotoni of Mali are a small tribe, speaking the Jowulu language, Bambara and French. 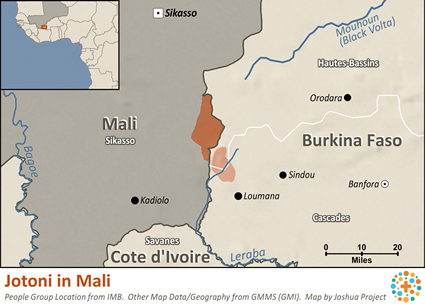 Conditions in Mali are often harsh, with GNP of only $800 per person. Mali's subsistence agricultural economy is often devastated by drought, famine, desertification and locust plagues. The country has freedom of religion, in spite of the large Muslim majority. The Jotoni tribe is animistic. The land of the Jotoni is not hospitable to outsiders, conditions are often harsh. Perhaps the many Christian believers in lands to the south of Mali will be burdened for the tribes of Mali. Pray for this, and that they won't overlook the small Jotoni tribe. There may be no believers in Jesus among the Jotoni tribe at present, but pray for those the Lord will soon lead to himself. Pray they will be completely humble and gentle toward one another. Pray the Jotoni tribe will be able to provide for their families, with clean water, sufficient food and shelter, and schools for their children. View Jotoni in all countries. Location in Country: Sikasso region: Kadiolo circle, Loulouni commune, 12 villages on Burkina Faso border.